Emerald, the birthstone for May, has been beloved for millennia, evoking rebirth and renewal. Widely regarded as the definition of green, emerald is the perfect colour for spring. From the poetic description of Ireland as “the Emerald Isle” to the vibrant green of the famed gemstone itself—the May birthstone has captured hearts and minds through the ages. Variations of this rich green colour suggest soothing, lush gardens. Legend has it that emerald has the power to make its wearer more intelligent and quick-witted, and it was once believed to cure diseases like cholera and malaria. Today, it's the gemstone given for the 20th and 35th wedding anniversaries. From Egyptian pharaohs to Incan emperors, emerald has enchanted royalty. Cleopatra was known to have a passion for emerald and used it in her royal adornments. The legendary Crown of the Andes, fashioned in colonial South America, is one example of how the Spanish revered the May birthstone. According to lore, its largest stone—now called the Atahualpa emerald—was taken from the last Incan emperor, Atahualpa, by conquistador Francisco Pizarro. The emerald and gold treasures recovered from the sunken 17th century Spanish galleon Nuestra Señora de Atocha represent a small fraction of the colonial riches sent to Spain from the New World. The word “emerald” comes from smaragdos, ancient Greek for a green gem. Roman author Pliny the Elder, who died in the 79 CE eruption of Mt Vesuvius, wrote in his encyclopaedic Natural History that “nothing greens greener”. He also stated that the May birthstone had therapeutic properties that helped gem cutters: “[they] have no better method of restoring their eyes than by looking at the emerald, its soft, green colour comforting and removing their weariness and lassitude.” Science now proves this belief: The colour green relieves stress and eye strain. The green birthstone was also thought to have magical powers. By placing it under the tongue, one could see into the future. Some believed it made one an eloquent speaker and exposed lovers who made false promises. Colombia has been the source of the finest emeralds for more than 500 years, and Colombian emeralds are the standard by which all others are measured. Three mining sites in Colombia are particularly noteworthy: Muzo, Chivor and Coscuez. 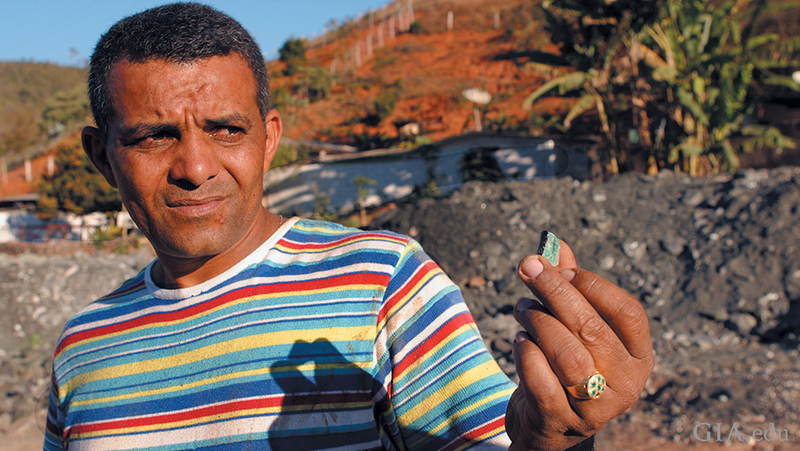 Each locality produces a range of colours but, generally speaking, darker tones of pure green emeralds come from Muzo. Emeralds that are lighter in tone and slightly bluish green are associated with Chivor. Slightly yellowish green emeralds are unearthed in Coscuez. The May birthstone is also found in the state of Minas Gerais, Brazil. One of the most productive sites for the green birthstone is the sophisticated Belmont mine. Capoeirana is another important locality, a rugged region worked largely by independent miners and small-scale operations. The May birthstone can also be found in Africa. Zambia is a major source, and mines in the Ndola Rural Restricted Area are known for producing emeralds that are bluish green and darker in tone. Pakistan and Afghanistan are important producers as well. 1. Dyeing: Paler emeralds with multiple fractures may be dyed green to enhance their colour. 2. Fracture Filling: Oils, waxes and artificial resins are often used to fill surface-reaching fractures in emeralds. The goal is to reduce the visibility of the fractures and improve the apparent clarity. The volume of filler material present can range from minor to significant; the different substances have varying degrees of stability. The May birthstone requires some special care: Avoid exposure to heat, changes in air pressure (such as in a plane cabin) and harsh chemicals. Never put an emerald in an ultrasonic cleaner, as the vibrations and heat can cause the filler to sweat out of fractures. Filled emeralds can also be damaged by exposure to hot water used for washing dishes. The safest way to clean emeralds is to gently scrub them with a soft brush and warm, soapy water. The May birthstone is perfectly suited to the celebration of life blooming everywhere. Given the rich green hues of emerald, it was inevitable that we would fall under its spell. Productive mines around the world ensure that all who love green or are born in May will continue to be enchanted. Now you can treat yourself – or a loved one – to an emerald that captures the exuberance of the season. Learn more about how to pick a beautiful emerald with our Emerald Buying Guide.